Christ University Law Entrance Exam is one of the most pioneer in BA LLB, BBA LLB. The university established its school of law or law college in 2006. Since 2006 the law college of the university has been regularly rated among the top law schools in the country. The law entrance exam is called CULEE. CULEE 2018 is going to be held on April 24, 2018. This article will take you through the Christ university law selection procedure of the CULEE exam 2018. There are five stages in the Christ University law selection process. These are the law entrance exam, the group discussion, the skill assessment test, micro presentation, personal interview, and assessment of the academic performance in Grade X-XII. The law entrance test is of 120 marks and consists of 5 sections i.e. English, General awareness, Reasoning, Maths and Data Interpretation. Group discussion is the next step of the CULEE selection procedure and will last a total of 35 minutes. In the group discussion, you will be given a few minutes time after the topic is assigned to jot down your thoughts on the subject. It is important to contribute to the talk with your inputs, and also to listen to others, and state your agreement and disagreement to the points made by others. If someone speaks in disagreement with you then counter that with another statement as proof of your original statement. The skill assessment tests consists of two parts. The first is the written assessment test and the second is a verbal assessment. In the written assessment test one has to write on an A4size sheet about the assigned topic for not more than the duration of 10 minutes. The verbal assessment test will be held in combination with the personal interview which will be a test of your behavior, level of discipline, your personality and how you market yourself. Here you have to prove to the examiners how you are better than every next person in the room. The micro presentation is a short presentation on a topic related or events in the field of the business world, sports, important events, and related to famous personalities. The students have to prepare an extempore beforehand. The topics will be notified in advance. Like discussed above there is also the personal interview. The questions could be about describing yourself in detail or in a few words, the area of law in which you want to make your career and why, your achievements in school, your hobbies and interests, where you got your inspiration to do law, your parents and siblings, where you want to see yourself 10 years hence and more on the same lines. The academic performance would also be taken into account prior to final selection. This is the last and final aspect of the law entrance exam selection procedure. This is the sequential detail of process followed for the selection of law students in CULEE 2018. A merit list would be prepared after the law entrance exam. The merit list students selected after the law entrance exam on the basis of cut offs would be called for counseling where the Skill assessment and W.A.T, micro presentation, G.D, and P.I would take place. Then a final merit list will be made and all these students further selected are going to be eligible for admission to the 300 BA.LLB and BBA.LLB seats available in School of Law, Christ University. Selected students would get a chance to make the best of Christ school of law's brilliant infrastructure, international curriculum and national and international extra-curricular activities, getting an opportunity to study alongside international students, and making a sterling career in law and getting established as a lawyer by either sitting for placements or making their own career path or by making their law studies in Christ college as the foundation for further studies, and gaining expertise in the legal area of their choice. 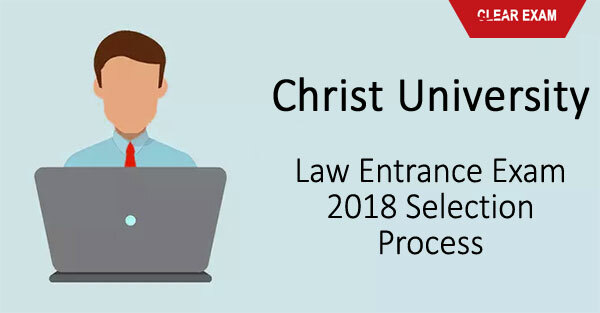 Check here the complete selection procedure of CULEE 2018.Read here the complete details on Christ University Law Entrance 2018 Selection Process.